First of all thanks a lot for following and reading my blog. I am really happy to share my life’s journey with all of you. 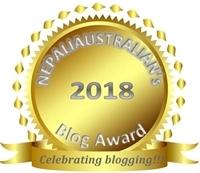 My blog nepaliaustralian has been nominated for the Best Australian Blog 2013 People’s Choice award which is judged by… YOU so please help me win by voting for this blog. It’s really easy and takes less than 5 minutes. It’s open until the 30th of April, but why not to do it right now? Click on Vote here image. To vote, all you have to do is tick the box next to the blog nepaliaustralian. Continue to press Next until you press “Done”. This entry was posted in General and tagged awards, Best Australian Blogs 2013, Best Australian Blogs 2013: People’s choice, choice award, ote for Best Australian Blogs 2013: People’s choice, thanks for your support. Bookmark the permalink. Shoot. Sorry I missed this, M! Thank you so much LF. Voted for you. Good luck! Keeping fingers crossed.